KODAK INDUSTREX T200 Film is recommended for critical imaging applications, since it can be used in multiple film loads to provide you with an extended imaging range. 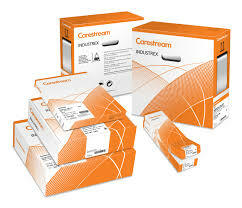 Best of all, it incorporates Carestream Health’s patented T-GRAIN Emulsion technology. T200 Film is a medium-speed, high-contrast fi lm with very fine grain. T200 Film is an En 584-1 Class 4 film and our fastest ASTM E 1815 Class I fi lm. It’s tough and durable—T200 Film can withstand high temperatures, and it’s less susceptible to handling and static artifacts. It’s also versatile–you can use it with direct x-rays or with lead foil screens. T200 Film can be processed manually or automatically in a range of processing cycles.